NEW YORK—Smiling wistfully as he gazed at the cherished mementos that had sat on his desk for much of the past 20 years, former Fox News commentator Bill O’Reilly reportedly grew teary-eyed Thursday as he packed up the framed up-skirt photos from his work space following his termination by the cable channel. 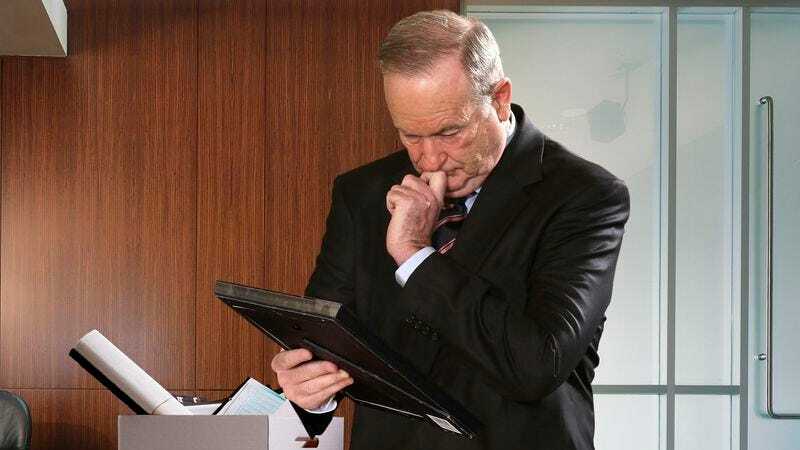 “God, I have so many great memories from this place,” said the longtime host of The O’Reilly Factor as he stared down at the 8-by-10 glossy print showing a woman’s exposed underwear taken from underneath a news desk, before wrapping it in tissue paper and placing it gently in a cardboard box alongside a smaller three-panel frame containing photos of various women’s bare thighs. “I worked with some truly amazing people who showed me some incredible things over the years. I’m really going to miss everything I got to do at this place—it was always such a good time. It’s hard to let go.” At press time, O’Reilly was seen wiping away a tear from the corner of his eye and popping a small down-blouse photo of a woman’s cleavage out of its frame and placing it carefully in his wallet.